Sweet Corn and Sundried Tomato Chowder with Goat Cheese and Chive Croutons is a lovely summer soup and can be served hot or cold! It was refreshingly chilly here last week. Not exactly cold, but we did light a fire in our outdoor fireplace one night and my husband put on a light sweater. We’ve got a lot more summer to look forward to, but even a rare cold snap in the middle of summer got me thinking about soup. 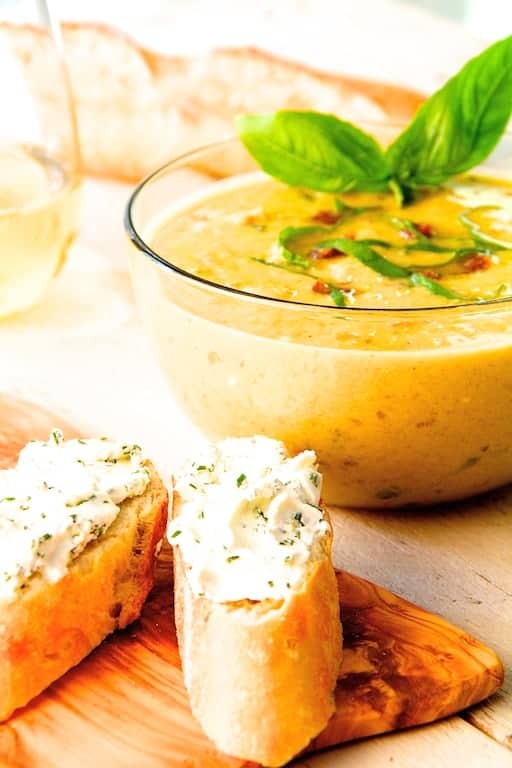 I adapted this Sweet Corn and Sundried Tomato Chowder with Goat Cheese and Chive Croutons from one in The Wine Lover’s Cookbook, Great Recipes for the Perfect Glass of Wine by Sid Goldstein. One of the things on my “souvenir list” when we travel is to purchase a cookbook specific to the area or country where we’re traveling to. This one came home with me from a trip to the northern California wine country. There are lots of GREAT recipes in this cookbook–all paired with the perfect glass of wine. I love that this soup is so versatile. The original recipe calls for serving it chilled as an appetizer, however, Mr. Goldstein does say that it can be served hot. I prepared it for some friends who were in town for the weekend so I had them try it both ways. They preferred the soup hot. We enjoyed it along with a chicken salad over fresh baby greens and a platter of juicy peach slices. The original recipe also calls for tarragon rather than fresh basil, but I love sweet corn and fresh basil together so used that instead. Along with the sun-dried tomatoes in the soup, I think the three are a winning combination. To get the sour cream incorporated smoothly into the soup, I suggest removing about a cup of the hot soup to a small bowl, then blending the sour cream into it first. This “tempers” the sour cream so that it doesn’t “break.” After you’ve got some of the soup and the sour cream blended together smoothly, stir it into the rest of the soup. For a wine pairing, serve with a crisp, chilled chardonnay or sauvignon blanc. Bring 2 cups of water to a boil in a small saucepan. Remove from heat and immerse the sun-dried tomatoes in the water. Set aside. Scrape the kernels from the corn cobs using a serrated knife. (You should have 2 generous cups.) Reserve cobs. Heat olive oil in a soup pot over medium-high heat. Add onions and cook 5 to 7 minutes or until softened. Stir in the garlic, cumin, turmeric and 1 teaspoon lemon zest. Cook 1 more minute. Add the wine, stirring to scrape the bottom of the pan. Add chicken broth, corn and reserved corn cobs. Bring to a boil, reduce heat and simmer covered for 12 minutes. Remove cobs with tongs and discard. Allow to cool slightly. Working in batches, carefully transfer soup to a food processor or blender and process until almost smooth. Drain and chop the sun-dried tomatoes; add to soup. Place sour cream in a small bowl. Add 1 cup of hot soup to sour cream and whisk to combine, then stir mixture into soup. Stir in chopped fresh basil. Keep warm. Preheat broiler. Combine softened goat cheese, chives and remaining lemon zest in a small bowl. Spread onto sourdough slices. Place under the broiler for 5 to 6 minutes or until the goat cheese lightly browns. Garnish each bowl with thinly sliced fresh basil. Serve croutons with soup.